Sign Up For Your BONUS GIFTS! The Sacred & Delicious Food List is an addendum to the cookbook, Sacred & Delicious. Author Lisa Mitchell decided to distribute this comprehensive list of the foods through her website so that she would be able to update it more easily. These are foods found in most modern kitchens. The list organizes the foods into categories to reflect how they fit in your diet from an Ayurvedic perspective. An in-depth discussion about how diseases take take root and evolve in the body from the perspective of Ayurveda. Need a quick side dish to finish off a meal with perfection? Enter sautéed asparagus, my favorite side to accompany almost any menu. It comes in especially handy when you’re making a complex main dish that is time-consuming and you need an easy recipe to complete the meal. With organic asparagus still in abundance around much of the country, I’m offering this recipe as a follow-up to last month’s asparagus soup. Asparagus complement many menu centerpieces, from legumes, vegetable entrées and casseroles to more omnivorous fare. You can add asparagus to a salad for panache. Surprise your beloved with asparagus in a goat-cheese or all-veggie sandwich. I call this recipe a seven-minute side,* but if you buy pencil-thin asparagus they will cook in three minutes! If you buy the extra-thick stalks, the dish could take as long as 10 minutes, but that’s prep to plate. 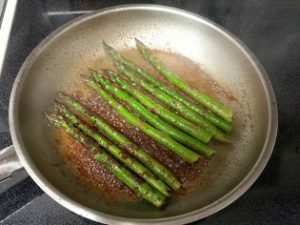 I like to sauté asparagus with cumin and coriander, a classic Ayurvedic pairing that balances agni, the digestive fire. I slip these spices into at least one dish every lunch and dinner to aid digestion, although supporting digestive health is not the only motivation for using the cumin/coriander combo. It’s the “secret” flavor foundation for many of my recipes, giving each dish an added boost that takes vegetables from bland to awesome! I find that when I use cumin and coriander in moderation, they don’t overpower other spices. In fact, the duo can simply enhance more traditional, American-style herbs such as fresh basil or rosemary. 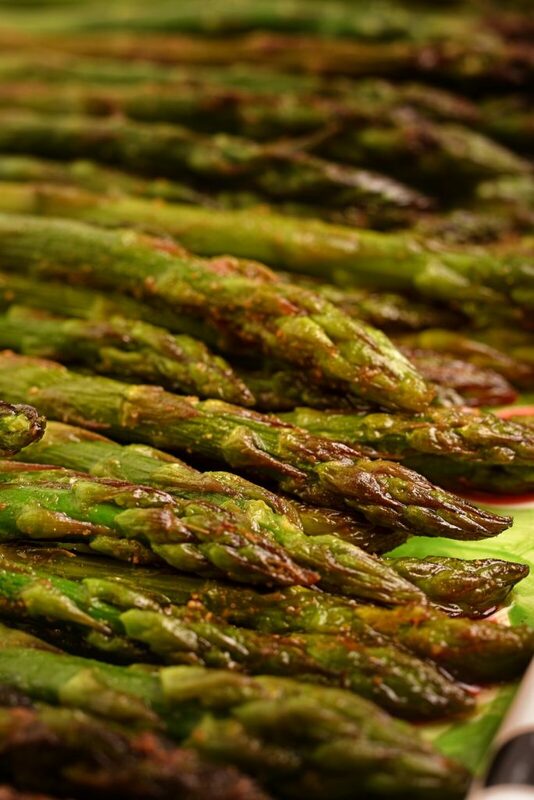 Enjoy this asparagus side dish — one you’ll love to make and is sure to please! *PS This is the first installment in an occasional series of Seven-Minute Sides. 1. Rinse the asparagus in water. Break and throw away the woody lower quarter or third of each asparagus spear (unless you prefer to peel the tough part, which will add a few minutes prep time). 2. Heat the ghee or oil in a large sauté pan on medium-high heat. When the oil is hot but not smoking, sprinkle the pan with coriander and cumin, add the asparagus, and splash with Bragg’s. Cover the pan and cook for 2 to 3 minutes on medium-high to sear the spices. Remove spears from the pan when the asparagus are tender when pierced with a fork or skewer. With thicker spears, continue cooking on medium-low another 3 to 4 minutes, until tender. Taste and add more Bragg’s as needed. Limit Bragg's to 1 tablespoon, as overly salty food increases pitta. I’ve never prepared asparagus like that. I can’t wait to try it. Thanks for posting – I love your recipes. Lisa, this sounds delicious! I will try it next time. It’s asparagus season and we have it growing fresh here! Thanks, Jeanne! It’s great when “delicious” and “easy” go together!